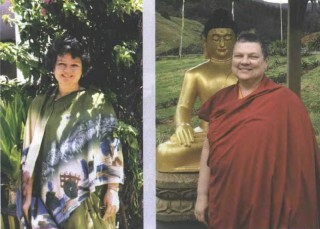 Annie Coats in her first year at the orphanage, and Ani Tenzin Desal after ordination. In 1995, Annie Coats had a stroke. Determined to spend her remaining years in service, she gave up her possessions and her life in the US to return to India, where she had been regularly visiting a Sufi teacher since 1987, and where she had completed a three-month fellowship in 1993. Children in the orphanages in India are the greatest healers in the world. They perform the most complex psychological feats of healing without ever earning any degrees or attending any seminars. They heal with a power far greater than any drug, operation or therapy. Their power is the unconditional love of a child, channelled through a clear mind and the purity of a brilliant heart. On the way to the orphanage on that bright spring morning, I was told to prepare myself to see the “rejects of society”. Well, I saw the twisted arms and legs, the enlarged deformed heads, and the too-thin, dysfunctional bodies. But no one could have prepared me for the experience of the incredible light emanating from the eyes and hearts of these children. I felt humbled before these brave beings who had reincarnated in these pathetic bodies, and in these tougher-than-you-can-imagine circumstances.